This Shademaker Add a room will only fit Shademaker bag type awning. There is a two week delay in shipping this item. Our Add-A-Rooms are manufactured of durable white vinyl laminated fabric and tough fiberglass screen. Max. 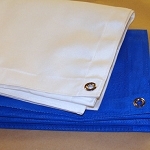 awning rail height 99'' The unit attaches quickly and easily to velcro built into the ShadeMaker Bag Awning. Add-A-Room includes skirting and 3 large privacy zippered screened windows with roll up flaps. Color: Polar White. Meets CPAI84 industry standards. Made in the USA. Awning products can incur shipping damage. They may be returned in the original packaging for credit or refund for damage or defects. Allows you to enjoy the great outdoor in privacy. Made from a heavy-duty tri-laminated vinyl fabric with large fiberglass screen windows and zippered roll up flaps. It includes adjustable rafter poles, full length skirting and wheel covers. Meets CPAI-84 requirements. Available in white only. All sizes come FINISHED SIZE 11" shorter than the listed size, i.e. RA15 = 14' 1" fabric finished. The height at the back awning rail to the ground is a standard 104". 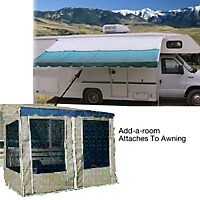 Designed to fit roll-up style RV awnings only with a standard 8' projection.